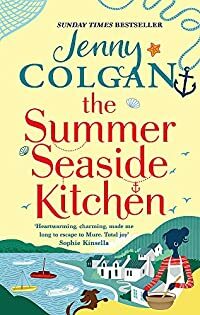 The Summer Seaside Kitchen by Jenny Colgan was published in 2017 and I believe it’s the first book by the author that I’ve read. I decided to read it as I’ve been avoiding really heavy books for a wee while, the Brexit mayhem and such was getting me down and this one seemed to fit the bill as a light read. I really enjoyed this it – to a point, there were some things that annoyed me, but more about those later. Although the setting at the beginning is dirty and sticky London it isn’t long before the action moves to a peaceful Scottish island called Mure (it’s fictional). Flora has been working in London, she’s a very junior lawyer there and her mother had always encouraged her to get an education and have a life away from Mure and spread her wings. A billionaire has moved to the island and although he had promised to bring work and to invest in the island in reality he has kept very much to himself, employed non-islanders and the islanders haven’t gained anything from his presence. Now he needs the help of a hot-shot law firm as the luxury hotel he has looks likely to have an off-shore wind farm as a view – and he wants to put a stop to that. Flora is sent up to Mure as she obviously has local knowledge, she’s not happy to be back, there are too many bad memories, her mother is now dead and her father and three brothers aren’t exactly happy to see her. So far so good, I liked Flora and in fact there are plenty of likeable characters in this book as well as a lovely sense of the island landscape. What annoyed me was that I think that if a writer is writing fiction then they should make sure that they change things that might be too much like real life. I know a few authors and they often say that they get ideas for their books from the news, but don’t make it obvious. Surely everybody knows that Donald Trump threw a hissy fit when he didn’t manage to get the plans for an offshore windfarm close to his Aberdeenshire golf course thrown out. I think at the very least Jenny Colgan should have changed the windfarm to a salmon farm or even to a tidal wave energy turbine – anything but wind turbines. Otherwise the story was too predictable and it annoyed me how many times Colgan had Flora turning red or pink, she seemed to suffer from terminal embarrassment. Otherwise this fitted the bill as an entertaining light read. This entry was posted in Books and tagged Jenny Colgan, light fiction, romance, Scottish author, Scottish setting, The Summer Seaside Kitchen by Katrina. Bookmark the permalink. That’s very interesting about the Birnam Book Festival. Unfortunately I am away that weekend, it seems that just about everyone has chosen that weekend for some sort of ‘do’. I hope it’s a success and that it will continue next year as I would love to go. I’ll do a wee post on it. I just finished this book myself, though the title was different –I think it was The Cafe By The Sea. I read it for the same reason you did, and felt almost exactly as you did about it! And unfortunately….hissy fits are the norm over here now,much to our national sorrow and embarrassment. I’ll definitely read another of her books, I just hope that she veers away from things that are in the news and is more imaginative in her storyline. We in Scotland knew what your POTUS was like due to our experiences with him and his golf businesses . It’s astonishing to me that people could vote for him, but at the moment our politicians are a useless bunch of idiots too although they have a way to go to be as shameful as yours I think.